The last two weeks have been very busy at the college and the focus has been on strengthening connections with our community. Our information evening for year 8 parents to share information about our curriculum and opportunities for year 9 and 10 was well attended. The exciting transition programme from year 8 to senior college was discussed, the new subjects we offer and leadership opportunities in particular. There were a number of questions about the accelerate class (year 9 and 10) and the provision for gifted and talented students which is run through the DEEP programme as well as the NCEA achievement standards offered in year 10. In short we learnt a lot from the interaction and appreciate the parents’ perspectives offered at the meeting. The Senior Leaders who attended and I felt that those who were able to attend have a better understanding of how their children can benefit from a further two year transition in an environment which is specially designed for this age group. Our students succeed wherever they go after year 10 and I am convinced that this is due to the opportunities they receive in year 9 and 10 which enable them to build and grow on the foundations laid in year 7 and 8. On Friday we trialled a breakfast for boys to attend with their significant adult. The event was well supported by Family and Friends and students and staff led by Mr Penfold. Our guest speaker Mr Richie Barnett, former National Rugby League star and commentator shared some personal perspectives on the importance of having someone who can support and guide our young men and his speech was well received. A similar event for our girls is being planned for later in the year. Last but certainly not least was our inaugural Matariki Celebration Evening organised by Mr Tuhaka and the Maori and Pasifika Committee. Students, staff and parents came together to provide a wonderful evening of entertainment and insight into the meaning and significance of Matariki. The performances were extremely entertaining and we look forward to some of the singers and dancers appearing at Talent Show this Thursday! It is gratifying that these efforts to connect with our whanau are appreciated and that so many parents have made an effort to strengthen our connections for the benefit of our students. Last week, Mrs Hewlett and I had the privilege of attending the 23rd Student Leaders’ Convention at the Hwa Chong Institution in Singapore. We are the only school from New Zealand who has this opportunity and our students were able to share their thoughts, views and experiences with students from India, Hong Kong, China, Australia and Singapore. The theme of the conference was “Amity – Achieve As One” and delegates explored various sub-themes ranging from cyber wellness to elitism and racial discrimination. These themes were presented after two days of workshops to the judges and finalists announced at a festive finale. I was incredibly impressed by Singapore and Hwa Chong Institution. The school and the government agree that much of their success has been achieved by finding solutions to problems that are unique and perhaps may not work in other societies – context must be considered. However the ideas of “win-win” or both parties being prepared to compromise if there is disagreement and a strong sense of community where consideration is shown to the environment and those less fortunate than others resonated powerfully with our own values. I believe we and our students emerged better from the experience and I express my appreciation to Mrs Hewlett for her time and effort and to our students for their impeccable behaviour – they were true ambassadors of our school and our country. By virtue of our strong association with Hwa Chong Institution three teachers have been invited to an international conference as members of SWIFT (Schools with an interest in future technologies). This provides us with an opportunity to share our experiences with schools from other countries which maintains our innovative approaches to learning. This Friday we encourage staff and students to wear a pink shirt or item of clothing to join an international movement that celebrates who we are rather than isolates or persecutes those who are different. Many schools will be promoting “Bullying free week” in New Zealand, however we and the primary school prefer to promote a more positive message. Whanau assemblies will remind students and staff of how we can make a difference on an individual level by being friendly, welcoming and mindful of how other people feel and the effect of what we say or do. Our school has countless ways of making people feel included, ranging from the year 7 camp to DEEP classes which have students mixing from every whanau and every year level. Our whanau engender a sense of belonging, our extra-curricular programme encourages teamwork and our learning programmes promote collaboration which all contribute to making MHJC a safe learning environment. We also wish to ensure that everyone feels safe hence the title Safe school week. A proactive way to add to the well established communication pathways for students who can see a trusted adult – Learning Advisor, Senior Leader, teacher or coach is a new email system which will allow students to report their concerns for themselves or their friend who may be experiencing a difficult time. This may have been caused by any number of factors but includes persistent, personally directed messages which often appear on social media and originates outside school. The email address safeschools@mhjc.school.nz will be trialled to see if we can help students who may not normally come forward to do so knowing their message will be confidential and dealt with sensitively in the first instance by our counsellor. I believe we have a wonderfully vibrant school culture which is based on respect and understanding. However it is important from time to time to reinforce what we do and why we do it to make everyone at MHJC feel safe and valued. I am excited to say that we have never had so many players and teams represent the college as this year. This is due to the efforts of our Sports Department, enthusiastic students, passionate supporters, teachers and volunteer managers and coaches. With the high number of students involved in winter sporting activities it is worthwhile reminding ourselves about how our attitudes and behaviour can influence our children. I am pleased that in my time at MHJC I have seen outstanding sportsmanship. On Saturday our girls’ premier netball team was complimented by its opposition (who we had beaten) for being so gracious in victory. Our coach, the players and parents can feel justifiably proud of such a compliment which indicates a depth of character as much as sporting ability. We will be tested during the season. We play sport to win and sometimes the ball does not bounce our way or a referee may make a poor decision. It is up to us as adults to maintain a balanced perspective when this occurs and show our students how to respond to adversity by demonstrating resilience. Support our students and coaches in a positive manner and may we receive as many compliments for our conduct as for our performances. Thank you for your support and involvement, it is appreciated. As with tradition, term 1 ended with our Champion’s Assembly when students were acknowledged for achieving excellence in our four cornerstones of extra curricular activity. 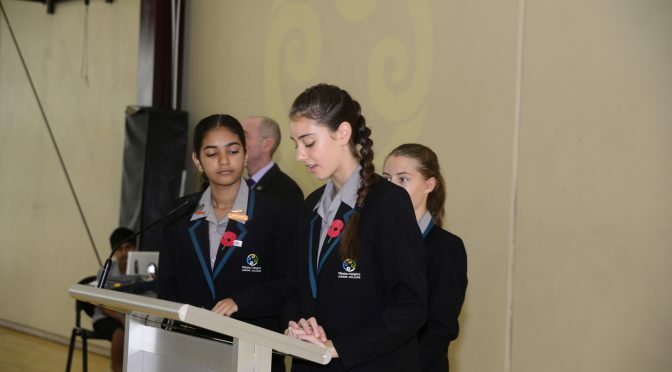 We also recognised ANZAC Day with a poem read by Paul Chen who entered the ANZAC Poetry Competition run by the Auckland Museum and “In Flanders Field” by John McCrae read by three members of our Executive Council. The assembly closed with the school singing the National Anthem and respectfully reflecting on the personal and collective sacrifice of those who fell during a minute silence. Our Executive Council will be joining the parade marching from Stockade Hill, Howick on ANZAC Day at 11 o’clock – we hope to see you there. The start of 2017 has been significant for MHJC. The school has taken a direction which will continue to ensure it is at the forefront of teaching and learning. The innovative approach of providing shared, stand-alone desktop computers has been replaced by a BYOD policy. This allows every student the chance to benefit at any time and in any place (including home) from the well established digital learning platforms provided by the school. It has also allowed teachers to push the boundaries of e-pedagogy for the benefit of our students which had become limited by our existing IT infrastructure. The use of digital technology is a well established practice at MHJC so the transition was not expected to be too difficult, however I wish to thank the teachers and support staff who have helped to successfully deliver this important outcome, particularly the IT Managers, Mr Mark Chang, Mr Ben Doughney and their assistant Mr Razak Shukor. I would particularly like to thank our supportive parents who realise the need for their children to be as well equipped as possible to enjoy the benefit of learning in a digital age. We look forward to continuing our journey with you and helping our students to become responsible, capable digital citizens while valuing the importance of personal connections. A long and busy term comes to an end – my best wishes to our community for a restful recovery during the holidays. This phrase is on a poster at my gym and it has given me much food for thought. The first is that I should not take it personally as an observation of my efforts at the gym! More importantly I think it is a valuable lesson to us all that while we should strive for excellence this should not come at a cost to our personal wellbeing. Perfection is an ideal – the perfect note, speech or performance may be unattainable but progress towards this goal is still worthwhile. This is particularly relevant at this time of the year as students reflect on their progress and articulate the short term and long term goals for the year during Student Led Conferences. Their e-asTTle scores are available and these will form the basis for the progress they will show in reading and Mathematics through the year. A key message to everyone at the school is that we analyse this data very closely, not only to assess individual and collective progress but also to evaluate the impact of our teaching. Another phrase which is relevant to goal setting is that we learn more from our mistakes or failures than our successes. So set the bar high, strive for excellence but keep a balance and acknowledge that if we don’t quite make it there is nobility in making the effort. At MHJC we believe that it is important for our teachers to continue to grow as professionals after they have completed their teacher training and two year provisional registration period. Every year all teachers meet with their mentor, a senior leader who helps them to set personal and professional goals that align with the school’s strategic direction, annual goals and achievement targets. Our weekly professional development programme assists teachers to reach their goals by providing time and expertise within these key areas and teachers meet fortnightly again with their mentors to discuss their progress. One of our key objectives this year is to integrate the opportunities provided by the BYOD (Bring Your Own Device) initiative into our teaching so that our students can attain even higher levels of achievement and engagement. To prepare for this, teachers used the google platform for the first time last year and also experimented with a class set of chromebooks in each whanau. This year all our teachers will be training for and sitting the examination for google accreditation as a Level 1 Certified Educator which will improve our capacity to utilise the potential of the google platform and portable, personally chosen devices. Please join me in wishing all our teachers everything of the best in this journey. Once again we will experience the challenge, daunting for some, of a three hour examination. I will give the community feedback later in the year of our results without revealing the names of successful/unsuccessful candidates!